The SPOTD for this lazy Saturday happens to be a momentous one. 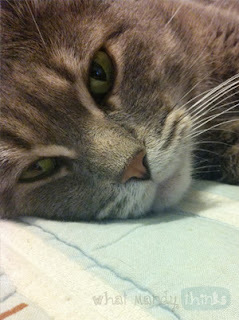 My cat Jimmy (image shown), as most cats, is not a fan of his crazy owner's overzealous affection. In Jimmy's case, a smushing hug that lasts more than a few seconds is the equivalent of throwing water at him. (This has been tested, I have witnesses.) But out of what seems like no reason at all, this morning I had at least 5 solid minutes of a purring cuddle fest. - Petting your pet sends a rush of oxytocin to your brain which helps relieve stress and makes you happy and all that junk. Cuddling is GOOD FOR YOU, people. That's science! - In my case, Jimmy kneeds his paws and purrs loudly when he's content in times like these, so there's an added bonus of a slightly vibrated massage to relieve some muscle tension. - Reciprocated affection is not something cats (or at least mine) normally show unless they want something like food, playtime, attention, etc. So when this kitty's tummy is full and he lets me wraps my arms around him for more than a few minutes, I feel like the Grinch when his heart grew several sizes and I just don't care why or how the cuddling was initiated. - Cats are fantastic pets, I don't care what anybody says. I'm both a dog and cat person (if I had to ratio it: 40% cat, 60% dog), but currently I am only able to afford and take care of properly a cat since I work a lot (and he could care less if I'm around or not most of the time). All this talk about cuddling makes me want to squeeze out another dose of oxytocin. Excuse me while I chase down my cat to attempt shattering this morning's cuddle record.